I can expend thousands of words and millions of electrons trying to explain what Albanian separatists think, say and do. Ultimately, those who do not wish to believe me will merely shrug and say "Well, you're an ethnic Serb, so how can you be objective?" Fine. Don't listen to me. Listen to an Albanian instead. Here's a commentary written by one Mehdi Hyseni (who may or may not be related to Skender Hyseni, spokesman for the provisional government). Hyseni currently lives in Boston, Mass. (USA) where he moved in 1999. Prior to that, he "earned a doctorate in international affairs at Pristina University" and "held professional positions in the Department of Translation, Information and Foreign Affairs in Belgrade" from 1978 to 1999, according to a 2003 bio. It was posted in a Serbian translation by Nova Srpska Politicka Misao (NSPM), which often publishes opposing viewpoints, without editorial guidance. I'm not that magnanimous, so I'll note beforehand that Hyseni not only had access to a doctoral degree under the "evil Serbian regime," but he also worked for the said regime even after 1989, when thousands of Albanians were supposedly disenfranchised and sacked from government jobs. And in Belgrade, no less. Keep this in mind as you read on. The translation from Serbian is mine, and is faithful as far as I can attest. If there are any discrepancies between the Albanian source material and the Serbian text, talk to the NSPM translators. Boston/Mitrovica, December 10, 2007 - The first extreme is the "philosophical and political" thesis of Serbian ethnocentrist (nationalist, racist, fascist, colonialist and genocidal) collective paranoid notion that "Kosovo belongs to Serbia", while the other reflects the abstract nihilism of official Tirana that "Kosova belongs to Kosova," instead of at least saying it belongs to Albania. Both of these contradictions will be clarified only when Kosovo achieves independence. The polished philosophical, utopian, decadent, existentialist and conceited speculation by dilettante analysts, reflected through the spirit and times of Communist philosophy of "brotherhood and unity" (that is, the Tito-Rankovic Yugoslavian "brotherhood and murder"), one cannot correctly interpret, or understand, let alone fight the colonialist and genocidal Serbian policy aimed against Albanians and ethnic Albania. Rather, it further clouds and obscures the theory and practice of the practical historical, political, philosophic, diplomatic and legal justifications for the solution of the colonial Albanian question in the Balkans. We should clearly understand the fact that decadent political philosophy cannot achieve the liberation, freedom and independence of Kosova and other territories of the colonized ethnic Albania. It is now a decisive historical moment (as Hasan Prishtina, our famous patriot and fighter for the liberation and unification of ethnic Albania, once said) for the president of Albania Bamir Topi and Prime Minister Sali Berisha openly say to Belgrade's face that "Kosova is Albania, not Serbia!" Otherwise, Serbia and the Greaterserbs will not stop howling and will never give up their anti-Albanian thesis that "Kosovo is Serbia." Until Albania officially declares that Kosova is Albania, both Kosova and Albania, as well as our loyal ally and savior the United States, will have disputes, misunderstandings and serious problems with the colonialist Serbia and the racist, fascist Greaterserbs, who believe "Kosovo is Serbia." 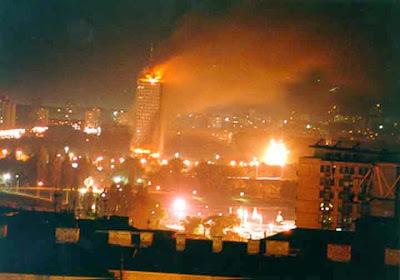 That Belgrade and the Greaterserbs make the colonialist and genocidal claim that Kosova is Serbia does not surprise us. However, that some Albanian "philosophers" in power still lack courage to defend the truthful counterclaim that Kosova is Albania, both to Serbia and to the world, not only upsets us, but urges us to suspect that the Albanian political philosophy still fails to understand that the cruel colonial and hegemonic Serbian rule cannot be rejected through pseudo-philosophical declarations that Kosova "belongs to those who live there"! Such political and national hypocrisy! Such an euphemism! Philosophical colorblindness! It is a lack of human and national consciousness, this lack of courage to tell the truth that Kosova does not belong to Serbia, but ethnic Albania. This truth needs to be defended by all legitimate legal, national and international means. The unmasking of many centuries of Greaterserb history, politics, propaganda, diplomacy, colonial and genocidal practice against the Albanians and ethnic Albania in the Balkans cannot be accomplished through thumb-twiddling and empty talk, using dilettante euphemisms and disgraceful, anemic, terrifying, speculative, moralizing, anti-philosophical, unrealistic and anti-pragmatic vocabulary. They need to be revealed before the world and called by their proper names, fully describing their anti-Albanian character. No people in the world achieved freedom and independence through the exercise of speculative concepts of colorblind and decadent philosophy, fed to the readers of mass media. So long as we Albanians in the Balkans are happy to be fed such anti-philosophical and anti-realistic produce (which are essentially nothing but imaginations of a false, romantic ,symbolic, "dialectic" philosophy of Nietzche's absolute individualist concern), we will live with slavery and Serbo-Slavic colonialism in the Balkans. No one in the history of Serbia and Serbs has ever given a more objective, humane and precise definition of Serb ethnocentrism than the great French philosopher Andre Glucksmann, when he said, "When Serbs say they are innocent, they express their utmost racism." This is true in every way - anthropological, historical, psychological, human and propaganda. The entire psychology and practice of world anti-Semitism can evolve, but not that of the Serbs. Its genesis is hereditary, passed from one generation to another and cultivated systematically and through institutions, from the family to the Orthodox Church, the academia, literature, poetry, drama, politics, diplomacy, the military, etc. In other words, Serbian anti-Semitism is not imported, but is an original manifestation of collective Serbian anti-Semitic paranoia, "Made in Serbia". This is the prime reason the Serbs even today cannot free themselves of the centuries-old muck of their maniacal philosophy that they are supposedly the "most peaceful, most democratic, most just, most cultured, most enlightened, most progressive and most civilized" people in the Balkans. All these negative concepts are organically part of the Greaterserb mythological ethnocentrism. This essential doctrine and practice of self-destructive, anti-Semitic ethnocentrism and Serbocentrism is the reason Serbia, in its historical, political, colonial and militarist continuity, has committed over ten genocides against Albanians and ethnic Albania (1842-1999). In this traditional ethnocentric (racist and fascist) style, the propaganda of modern Serbia began an official campaign against the independence of Kosova in Belgrade, on December 4, 2007. The initiator, overseer and director of this all-Serbian populist campaign, under the slogan "Kosovo is Serbia" is the Serbian government's Ministry for Kosovo and Metohija, headed by Slobodan Samardžić (member of the Serb negotiating team during the shuttle diplomacy efforts of Martti Ahtissari and Wolfgang Ischinger's "troika"), which "forgets" the truth that Kosova belongs to Albania, not Serbia, even though Tirana still lacks courage to say so. Now, some might say that this is by no means a mainstream Albanian argument, but a rant of a madman. Fair enough. Only trouble is, I've heard these "arguments" over an over from Albanians; they are all over Albanian websites, peddled by Albanian lobbyists and "advocates," openly preached to the general Albanian public (in Kosovo, at least). As far as they are concerned, all of this is gospel truth. Tell you what. Replace "Serbs" here with "Jews" and "Albanians" with "Germans." See how it sounds to you. Unfortunately, I've encountered any number of people lately, not all of whom are Albanians, who not only take such insane diatribes as gospel truth, but also repeat them all over the blogosphere. Evidently, some of them are trolling and stalking pro-Serb bloggers as part of the recent meltdown at Little Green Footballs. Even I was shocked when Charles Johnson, who most of us thought was one of the "good guys," started spreading the same blood libels against the Serbs that we have been hearing for so long. Naturally, his sycophants and supporters have started doing the same thing. I've given them all what-for. The sad thing is that I have encountered enough people - not all of them Albanians, by any means - who not only take drivel like this as gospel truth, but also go around repeating it all around the blogosphere. Lately, some of them have erupted out of the recent meltdown at Little Green Footballs. Seems that Charles Johnson - whom many of us thought was one of the "good guys" - suddenly turned on his fellow bloggers and began calling everybody "Nazis" where this clearly did not apply. After what the Serbs have been called for the past decade and a half, I could see where that was going. And was I ever right. Charles Johnson and his admirers and followers have been spreading the same old blood-libels against the Serbs, and I've been mopping up the mess as best I can. "Tell you what. Replace 'Serbs' here with "Jews' and "Albanians" with "Germans." See how it sounds to you. This reminds me of how some collectively blame Russia and Russians for the sins of the Soviet period. I'm reluctant to embrace a collective typecast on any group. Having said that, note the earlier "Greater Serbia" references. I don't recall seeing maps of that Greater Serbia relative to the number of Greater Albania maps out there. On who is the more tolerant, there's a significant difference between the situations in mostly Albanian inhabited Kosovo and predominately Serb populated Serbia, minus Kosovo. Michael, if you refer to the fact that Serbia is the most ethnically diverse of the former Yugoslav republics (while the supposed "tolerant democracies" of Croatia, Muslim-Croat Federation of B-H, or "Kosova" are virtually monolithic) then I agree entirely. Well at least for me it is 100% clear that it is by the advice from the US that Albania is not making the claim for Kosovo. One thing is to lobby for the independence of a "Kosovar" nation, but it is a whole new ballgame to change the border between two existing countries by force. Muslims see very clearly the Western intellectual shadow and use the language of multiculturalism and deconstruction to strike at that weak point.